From big name brands to custom built machines, we can can help you find the perfect computer! Building your own computer? 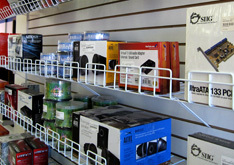 We have all the parts you need to get started! From cables to cases and everything in between we have everything you need to get the most out of your machine! We can order any part! Unlike the big-box companies we can order practically anything. We can have it shipped to our store or directly to your front door!